Book a skilled gutter cleaning expert in Omaha. Backed by a total satisfaction guarantee and amazing customer support. 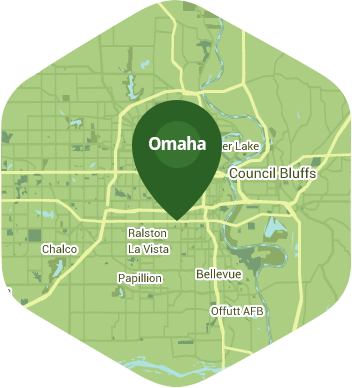 A lot of people know Omaha mostly for its corn, but what they might not know is that this city is where the bobby pin, Raisin Bran, and TV dinners were invented. Despite being a relatively quiet city, Omaha is one of the country's fastest growing cities and you will almost never run out of things to do here. Whether you're looking for a place with great food and beer, or somewhere you can relax for a bit you can bet that Omaha has it. If you want to truly experience what Omaha is all about, then you'll need to clear your schedule for the weekend and not think about cleaning your gutters. Leave the gutter cleaning to Lawn Love because it is one of the things we specialize in. Gutters are an important part of any home because they can redirect the flow of rainwater and keep it from damaging your roof, landscape, and foundation. They need to be checked and cleaned regularly or else they will become clogged with sticks, leaves and other debris. Gutters that are ignored may even be turned into homes for rodents, insects, and mold. Do not leave your gutters alone. Call Lawn Love and give them the cleaning that they need. We are bringing a 21st century touch to an industry. You can book and manage our services online, or through the phone. Learn more about our gutter cleaning service by calling us at 402-413-9143 or by getting a free quote online. Rated 4.89 / 5 stars in 871 Omaha customer reviews. There won't be any rain in Omaha today, which means you'll probably have to water your lawn. Dusk and dawn are the best times to water your lawn (the sun will rise at 6:40 AM and set at 8:07 PM today in Omaha). Here are some average lawn care prices for homes in Omaha. Average lawn size 5,067 sq. ft.